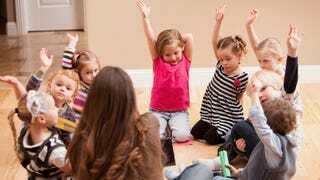 It’s a well-known fact that daycare is a financial drain on working parents; despite the often low pay of daycare workers, the cost of tuition and enrollment fees can easily run thousands of dollars a year. Now, new research from the Economic Policy Institute shows that in nearly half of the United States, full-time daycare is more expensive than tuition at in-state schools. The study, which we saw via Quartz, compared the state-by-state average cost of full-time daycare with the cost of tuition at a four-year public university. The results are eye-opening: In 23 states, daycare is more expensive than college. In Nevada, New York, and Florida, childcare costs double what in-state tuition does. According to EPI’s numbers, daycare in New York, the fourth most expensive in the United States, runs on average $14,144, roughly 107 percent more than in-state tuition; that amount is 21.2 percent of an average New York family’s income. In Florida, too, daycare takes a sizable portion of a family’s income, the average cost of $8,694 is 16.6 percent of a family’s income. But the numbers vary wildly. As Quartz points out, in states like South Carolina, where public college tuition is much higher and average income is much lower, daycare is less than half of the cost of college tuition. So, to some degree, the numbers speak as much to a state’s commitment to higher education as they do to economic realities. [...] The current patchwork of American policy aimed at aiding families in finding high-quality, affordable child care is deeply flawed. Nonrefundable tax credits leave many low-income families ineligible for these credits. Direct subsidies for low-income households are too narrow in eligibility, leaving too many economically stressed families behind. Worse, these subsidies are slowly withering, and are of little use to the growing number of workers with non-standard schedules. EPI recommends refocusing this “patchwork” approach with clear funding programs aimed at lowering costs and improving access (as anyone with a child in an urban area knows, waitlists are a killer). As the study argues, our national conversation about affordable education shouldn’t solely focus on college, it should also include early childcare—access to which is an absolute necessity for working parents and an important component of a child’s educational success.